In the Presentation Advisors blog, there’s a post called, “Audience Members are from Venus, Presenters are from Mars,” which explains some of the frustrations that presentation consultants and experts experience. Basically, if you ask the general public (audiences) what is bad about most presentations, they know. But presenters (who are obviously sometimes audience members) seem to be a different animal or to suddenly forget. Why? In a commentary on this post in the WebAttract blog, called, “Maybe Presenters Aren’t the Problem,” Bret Smith suggests management might be the problem. But management is doing the same Death by PowerPoint. Yes, companies should require presenters to go through presentation skills training; it will increase the profitability of the company. 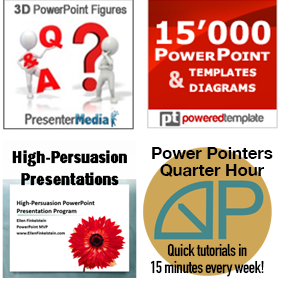 Colleges should include presentation skills training, at least for business majors. But neither is happening. It also explains why I started the Campaign Against Death by PowerPoint. I think that audiences could be more effective in changing the situation. After all, they are the ones who are suffering! It’s just a matter of getting the word out to audiences and helping them to get the courage to act. Why do presenters continue with Death by PowerPoiint? There are 2 reasons. The first is that ‘Management’ does it, therefore I must do it. The second is the Compliance Police who state, ‘That every slide must have the corporate logo, exact font type and size and it must be this colour.’ You haev to comply because it is in the compliance book. The sooner this type of thinking is put to rest, the happier (and more engaged) audiences will be. Thanks for mentioning my blog! It always stunned me that this cycle of Death-by-PowerPoint seemed to have no end in sight. No matter how many people complained, it seemed to never sink in the minds of presenters. I agree though that the only way to end this vicious cycle is to evangelize upwards, getting management to express the importance of presenting effectively to those that report to them. Thus, when employees are asked to present, they spend the time necessary to do it right. I agree, especially about the logo. But one of the reasons (besides branding) corporate types make those rules is that when they let everyone do whatever they want, the results are mostly awful. They don’t understand that specifying colors and font types don’t help very much. Instead, they need to give their presenters some skills they can use to design effective slides — as well as skills to deliver them more effectively.